By "burning with Athens" I mean with anger. The Merkel puppet Rompuy's storm troopers are reported as being behind some of the the riot police helmets and today those internet references are hard to find. Conspiracy theory or not, we all know the unelected despots of the EU are more than capable of bussing in "troops"! I despise violence but when the idiots in Brussels are arrogantly dismissive of protest, regardless of the violence raging in Greece and soon all over the EU, what can you say. Only last week the Belgian Fire Service strikers drenched their erstwhile police colleagues with hoses. What does it take to show these moronic politicians they're disastrously wrong? 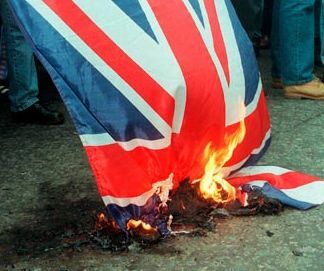 So as the EU drifts along with its ever so frequent meetings and gravy train summits, the real, burning anger is never on the agenda. Their Merkel Mizaru led attitudes no doubt have very deep meaning, which some of us may not live long enough to discover. What is certain is that the collapse of The EU Federal project gets ever closer. To use a phrase doing the rounds pertaining to default, only a choice between orderly and disorderly collapse is the issue! Richard also suggests another scenario which will ensure that federal stupidity is doomed. Were this to be true then the whole construct is buggered beyond imagination. What then for a weak, bankrupt Europe? Uncannily like a re-run of the late 1930s. Countries so enthralled to an all powerful Germany as to be unable to speak against it. We would have a fiscal dominance, indeed one already in place, that would lead to a spread of German control throughout the whole of Europe. Then, where next? A pact with Russia? That would also have great synergy until one or other of the parties called in the loans! Whilst the more backward Nations such as the UK believe in armed interventions the new, more powerful weaponry of finance is being deployed, using EU machinery, to go after our weakened economy. Where Churchill warned of German rearmament so we need, today, a voice to warn of financial surrender on our doorstep. Apart from John Redwood, I see no other figure with the foresight or intellectual capacity to make the case. Sadly. I'm so sorry, Michael. Hope the film finished well! "Germany's Bid for Great Power Status through the EU". We can be sure that, if the EU ceases to be an effective instrument of German policy, it will downgraded or discarded. Thank you Edward. We still have some Spitfires and the odd Lancaster! Ah, Blackbeards Ghost... I remember seeing it when I were a lad and the troubles of the world were of no concern of mine. Now I need someone to stop the world, 'cos I wanna get off. It is a madhouse, run by mad people doing consistently mad things without acknowledging the sheer madness of it all. I'm sure that the mass of humanity is being dragged down roads that, were they to be given the choice, they'd rather not travel. On second thoughts, make that a small minority of humans, those that are paying attention. The mass of humanity have no idea what's going on and will be herded whither TPTB wish, even unto WWIII. Oh for the days of innocence and Blackbeards Ghost. Xen, "Oh for the days of innocence and Blackbeards Ghost." Swallowed up by political and corporate greed.